Greendale - A Town Coming To You Soon! See Greendale Film Opening Schedule and other Greendale film info. "Shot in glorious Rustavision, of course. I love that blurry particularized home-movie effect." 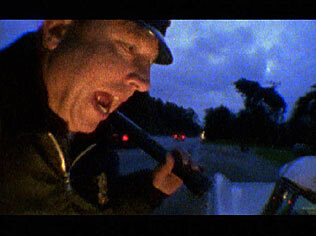 "The Greendale film was shot on Super8 and given a decidedly 'green' spin, Neil Young's raw nerve of a semi-experimental/semi-feature length music video Greendale is literal, unabashedly liberal, and saved by its energy, earnestness, and Young's electric song score. Inspired and rejuvenated, like a few of our better artists have been, by 9/11, Young contributes to the soundtrack for Greendale some of his best music with Crazy Horse since their eclectic album "Sleeps with Angels". Greendale follows the travails of the Green family. Grandpa is outraged by the reductions of freedoms and intrusion of the media, while son Earl is a struggling painter who gets the devil's specs and Earl's daughter, Sun (Sarah White), is an activist in the Julia Butterfly mold who headlines the film's best song: the rousing, anthemic "Be the Rain," played over a Thornton Wilder set. A cop-killing, a symbolic protest, a haunting vignette in a ratty motor inn all mark the peaks and valleys of the picture, through which runs Young's absolute dedication to his art, whatever the cost. 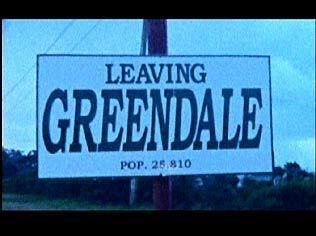 The curious thing about Greendale, however, is that despite the topicality of its issues, the prevailing feeling evoked is one of a sort of sympathetic nostalgia: the feeling that the sixties are flyblown regardless of what feels like Young's single- handed desire to keep them alive. It's well and good to campaign for the right causes, but the reality of our post- modern age seems more in line with ennui and ironic detachment--maladies of smug superiority that tend to throw what by all rights appears to be genuine conviction into a quaint context. Greendale is on-the-sleeve enough to ultimately prove a little embarrassing." "Whatever version of Greendale you encounter, it earns a place alongside the more ambitious expressions of small town living: Winesburg, Ohio; Our Town; even Altman’s Popeye. It’s both recognizable and idiosyncratic through Young’s scrutiny of our most mundane habits and setting them to music that kicks in even when the imagery perplexes. Greendale presents contemporary American crisis as seen through the characters of a white farming community. In Greendale, Young locates the unofficial territory where his outrage and his hope are not so strange. His defiantly unfashionable position gives voice to those Americans who lately feel completely unenfranchised–enraged by al Qaeda and Tom Ridge and isolated from Fox Cable News as well as the Nation. That this community has rarely been seen on the screen in our so-called indie era is a sobering realization. But it gives the Greendale movie surprising charm. The hominess of Greendale should be less troubling than Are You Passionate?. Its assessment of how folk-art expression (pop music, home movies) compliments our political and spiritual ideas and amounts to a revelation. Not many contemporary artists have responded to the post-9/11 question of how to make relevant art. Young proposes an answer by emulating the simplicity of folk art: the forcefulness of style, technique, purpose that can be felt in every version of Greendale. Two authentic moments stand out. On "Sun Green," Young sings, "No one could explain it/It just got great reviews." That sizes up the current tendency to praise superficial product regardless of its content or intention. Young critiques the political acquiescence that has infected every aspect of popular culture, replacing actual thinking, ever since the late-80s triumph of capitalism (what some people like to call the fall of communism). And the glorious "Grandpa’s Interview" offers a daring bromide: "It ain’t an honor to be on tv/And it ain’t a duty either"– blessed curmudgeonliness. Greendale’s a modest movie, but it’s also heroic." "Young's approach to the visuals can be astonishingly literal-minded - the phrase "a crow flew across the sky" is accompanied by just what you'd expect - yet he also brings clarity to songs that were bafflingly cryptic in their audio-only form. Likewise, musical performances that seemed excessively sloppy or meandering (yes, even for Crazy Horse) turn out to be just perfect for the ragged and dyspeptic nature of the work as a whole. While this is hardly the first time that Young has made a virtue out of roughness, Greendale still transcends its limitations with great success. Unlike anything you've ever seen (or maybe even wanted to), Young's movie is furious, fascinating and utterly fresh." "In Greendale, Young's songs provide more than the narrative and dialogue: They represent the spirit of joyful noise that makes everyone rise up and dance. If this sounds idiosyncratic, discordant and decidedly off-the-beam, it is, but then again so is Young's music - and Greendale is nothing if not a pure Neil Young experience. (It's simple: If you don't dig the music, pass on the movie.) Uncompromisingly amateurish,alternately naive and spooky, Greendale revels in the rough-textured images of Super-8 in the same way that Young and Crazy Horse have always exalted in the tumult of electrified guitar noise. It's a way of being heard in a world filled with meaningless noise. In this sense it is a uniquely and even inspirationally personal work - particularly if you're down with the movie's message that personal expression is mass culture's Public Enemy No. 1. Keep on rockin' for a free world. "It's a proudly handcrafted movie, overall, and good for Neil Young. At the same time, beware of stoner rock stars talking politics. No matter where you stand on the spectrum, the ecological/ anticorporate idealism of "Greendale" is so vague as to be insulting to anyone past the backpack-and-Birkenstocks stage of life. You want to rail against the globalist oligarchy? Fine, Neil - name some names. Offer ideas other than chaining Sun to a lobby statue while she barks empty slogans through a megaphone. Tell your fans to do something more than be the rain." "The message of the story is uplifting and so is the notion that Neil had something positive to say and was willing to share it at a time when most of the cultural focuses on negative aspects. I was so impressed by the music and the nobleness of the message that I chose not to download it for free off the Internet and instead bought the CD, although in the interest of full disclosure, the fact that you get a DVD of Neil's acoustic performance of Greendale is what sealed the deal for me." 'One of the most adventurous artists of our day enters new territory and returns with something strangely beautiful.' - - Glenn Kenny, Premiere Magazine "
Read more on the making of Greendale and commentary.